I have a confession to make: I try to pretend that my children aren't growing up. I *like* having them around. I don't want to be one of those women who is at a loss when their children are grown and gone, but I wonder sometimes if I'm headed in that direction. I get a little panicky when I think about it, so I try not to do that. :-) In the last few months, though, I have heard the Holy Spirit starting to speak in that still, small voice. He's bringing things like College Common Sense to my attention, reminding me that pretending my children will never grow up will not make it so, encouraging me to get my head out of the sand and focus on important things. When the opportunity came up to review the Going to College and Paying for it Online Video and Workbook, I didn't really want to take it. I'd prefer to believe I don't have to worry about college for my children just yet. The reality is, though, that my oldest will be in 8th grade next year, so it would be a good idea to start thinking about it and gathering information. Denise Ames is the author and creator of this program, and she comes with several years' experience in a university financial aid office. Her goal is to educate students and their parents about the financial aid process, choosing the right college, and ways to finance a college education beyond federal financial aid. She offers a free monthly newsletter, as well as free lesson plans via email, full of great information and ideas. The lessons are broken down into activities for parents, seniors in high school planning to attend college in the upcoming fall, high school students, middle school students, and elementary students. Additionally, you can purchase her Going to College and Paying for it workbook and DVD for $50, or sign up for 12 months' access to the online workbook and videos for $25. For the purpose of this review, I was given access to the online video and workbook. The program can work for all ages, but I think junior high and high school students will get the most benefit from it. It would most certainly be best to start before your senior year in high school! First, I printed off the workbook files for myself, so I had a copy in front of me. Then, I proceeded to work my way through the videos. I felt a bit overwhelmed at first - there is a LOT of information to process! However, she presents it all clearly and sequentially, giving specific steps to follow, which helped me feel much more knowledgeable and confident. Then, I had the girls create notebooks as she directed, proceeded to work through the activities she gave us in the weekly lesson plans. For example, in Week 1, she told us about the Free Application for Federal Student Aid (FAFSA) website, where if you are a high school senior, you should get a PIN number (both the student and the parents do this), and fill out the application for federal financial aid online. We didn't do this yet, but there is also a link to the "FAFSA4caster," which allows anyone to put in their current information and see what their expected family contribution, or EFC, would be if they were applying for college in the fall. It's great information to have, because even though the numbers could change over the next few years, at least you have a starting point for planning. Another great suggestion was to have my kids practice taking a timed test. There are tricks to them, and it's a good time to get them familiar with how they work. As homeschooled students, they don't really have timed tests. I did give my girls a timed math test, and it brought forth much weeping, wailing, and gnashing of teeth. Apparently we need to do them more often, which will require much exercise in patience for me. She describes lots of ways to go about gathering information for each child, and says it's never too early to start - she's seen a scholarship given to a child as young as 6! Even if college is a few years (or many years) away, there is something you can do to increase your knowledge about what your child wants to do and how to get them there. One great idea is the "All About Me" notebook. Your student takes a spiral notebook, nothing fancy, and uses it to write down things they like to do, things they don't like to do, volunteer experience, etc. It's a place to collect their thoughts about their interests, dreams, and goals to help them figure out what kinds of scholarships might be a good fit and which college might be best for them. This caused a great deal of stress for my girls, who seemed to be intimidated by it. I believe it will be an invaluable tool for them once they are used to the idea, and I'm glad we started it now. It will be interesting to see how they refine their interests and goals over the next few years. When I applied for college, I was clueless. I was the oldest in my family, so no one had been through the process before. I knew nothing about scholarships or financial aid, and depended solely on what came through my university's financial aid office. I found that my family's income was enough money that I didn't qualify for much aid, but not enough that we could just fork over the cash, so I ended up with a lot of debt. I've watched the cost of attending college skyrocket over the years, and know that it is more important than ever to plan ahead as much as possible. 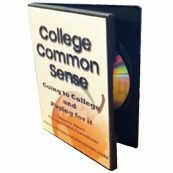 College Common Sense offers an excellent way to start the path to college - reminding all of us that it begins MUCH earlier than January of senior year in high school! I hope you will check out the website and DVD/workbook. It's an invaluable resource. Enjoyed reading your review. Stopping by from the Crew.